Wolf Marshall: I used the DM-2 analog delay and played with the time (Rate control) until it matched the track's rhythm. Here are the settings. Rate (3:00): about 75-80ms, Echo balance: 100% (original note and echo are the same volume), and Intensity: 0% (only one repeat). Wolf Marshall: This is very convenient setup and represents the simplest type of pedalboard with mounted stomp-boxes in series. It is controlled by a PSM-5 master bypass switch which also powers the pedals. My Boss board is currently loaded with a BD-2 Blues Driver for overdrive/distortion, GE-7 seven-band Graphic EQ for volume and gain boost, CE-3 Stereo Chorus, DM-2 Analog Delay, PH-2 Super Phaser. I also pop in a BF-2 flanger, DD-2 digital delay, and HM-2 Heavy Metal distortion pedal for additional/alternate sounds depending on the band or session. Wolf Marshall: Closeup of Wolf's Boss DM-2 analog delay. This is an older unit (circa 1982) and was used on the first three licks of this lesson. The three controls are: (L to R) Repeat Rate (speed of repeats), Echo (balance) and Intensity (feedback). This delay is good for delays in the shorter range: 20-300ms and has a warmer tone than digital delays but is not quite as noisy as tape delays. It is tube-amp friendly. I hope this helps! eddo: what does "tube-amp friendly" mean? Wolf Marshall: Lick 2 is played over the same groove (the jam track) and uses the same effect and settings for slap-back echo with a rockabilly bass-line riff in A. The point is: USE EFFECTS MUSICALLY. To say something. Wolf Marshall: That lick was like something from the old Sun Sessions. Wolf Marshall: Sean, the riff is universal. ginnym: I can't think of it, Sun Sessions, Blue Suede Shoes, who did that Wolf? Wolf Marshall: Gin, that was the earliest Elvis recording with the trio, Elvis with Scotty Moore, Carl Perkins, etc, that was Elvis when he was a rocker. SEAN: i have a nice rockabilly guitar here a 1965 silvertone semi hollw electric with bigsby and 3 d' armonds! Wolf Marshall: Get ready to rock! Lick 3 is a heavy rock lick in A with the infamous "runaway feedback" delay effect. This is similar to what Ed Van Halen did at the end of "Eruption." I also used the DM-2 analog delay for this lick but set it differently as in the following. Rate: (12:00) 150ms, Echo: 100%, and Intensity: 100% (multiple repeats in a looping feedback regeneration). The whammy bar is used to dive the last note down slowly during the runaway feedback for that extra degree of whackiness. tex: what scale is that? Wolf Marshall: Tex, A Dorian mode. a la Randy and Ed, All: be sure to listen to the audio file to hear the runaway feedback effect. ginnym: Rockabilly to Rocken Eddy ! tex: Wolf who do you say was the most innovative guitarist using effects? Wolf Marshall: Tex, there are many. I like Andy Summers, Eric Johnson, Steve Vai, Satch, Holdsworth, Jimi Hendrix, Beatles, Lukather,...so many..
ginnym: Wolf, why is that called a Dorian scale? and what is the formula? Wolf Marshall: Gin, the Dorian mode is built on the second step of a major scale. Like A in key of G as in this lick. ginnym: So if I were playing in A I would start w/B, correct? Wolf Marshall: Close up of Wolf's No.1 studio rack. 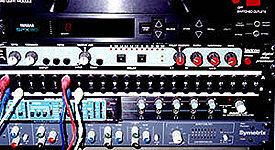 I use an SPX-90 and Lexicon PCM-41 for echo and delay in my personal studio. BTW, the Lexicon PCM-41 is a favorite effect of Steve Morse and Steve Stevens as well. tex: should I use pedals or rack effects Wolf? Wolf Marshall: Sean, that's not even half!! it's a good start. Here comes our last lick of the evening. Wolf Marshall: Lick 4 has a longer delay sound which allows guitarists to play harmony duets by themselves. This is a rock solo lick in E minor and is similar to the echo approach was used by Brian May and Joe Walsh among others. I used a Boss DD-2 digital delay at the longest setting of 800ms. The Echo Level was set for a slightly lower volume level (12:30) than the source note. The feedback is set for trailing echoes (9:30) for that in-concert arena effect. You have to plan your licks to harmonize them with echoes...experiment! This one has a Brian May influence. tex: so the delay creates the harmony sound? Wolf Marshall: That's right, Tex. You plan your lick to work in time with the repeats. ginnym: I swear I can hear overtones in that last lick ! Mike: Wolf, a minor scale is created when lowering 3rd's half a step correct?